Feel the pulse and dance the evening away on a private beach in Cha-Am. 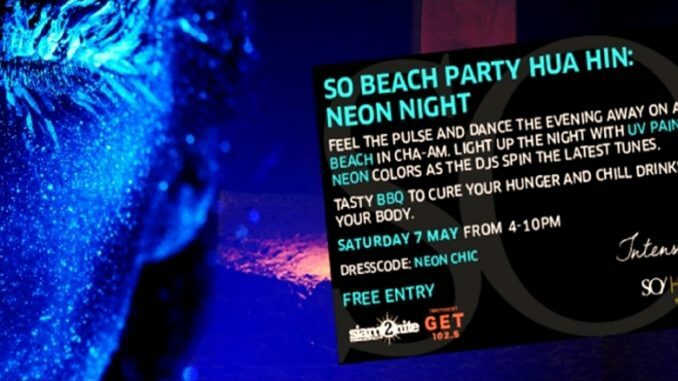 Light up the night with UV paintin and Neon colors as the DJs spin the latest tunes. Enjoy tasty BBQ to cure your hunger and chill drinks to cool your body. For those who would like to an overnight weekend, we recommend book the room early to secure your place and worry-free. Check out more details and invite your friends to join at the event page or at www.facebook.com/SOSofitelHuaHin. For more information and room reservation, please contact reservations (at) so-sofitel-huahin.com or call +66 (0) 32 709 555.